Whilst Villa’s 2-1 home defeat to Sheffield Wednesday rightly puts Bruce’s viability as manager firmly front and centre, there’s so much swirling around the Villaverse to consider. Our lumbering attempts to mount a promotion challenge sit against a backdrop of supporter unrest, employee sackings and the sudden threat of a points deduction in the 2019/20 season (The Times). In terms of the here and now, some of the issues lie squarely with Steve Bruce, others, for my money, can be shared as much with individual players. As incomprehensible as some of the team selections are, as baffling our lack of any clear style of play; how can it be that so many ‘talented’ footballers look both individually and collectively substandard? Despite experience, we harbour few leaders. Despite attacking talent, our threat is subdued. The defeat to Wednesday was as much a reminder of how much we continue to drift, unable to control a game of football over 90 minutes, let alone mount anything like a reputable case for promotion. Once more we arrive as a club at an uncomfortable juncture. Do we persevere and rely upon Bruce’s recurring prophecy that this team will eventually come good? Or do we cut our losses, re-appoint with much of the season ahead of us, with a single minded quest for promotion? Central to any miraculous recovery, you would think, would have to be John McGinn. Despite the inconsistencies of others around him, McGinn delivered certainly his best performance in a Villa shirt. We’ve seen the makings of a fine footballer before this fixture, but the £3m signing from Hibs has firmly underlined his value to the football club now. 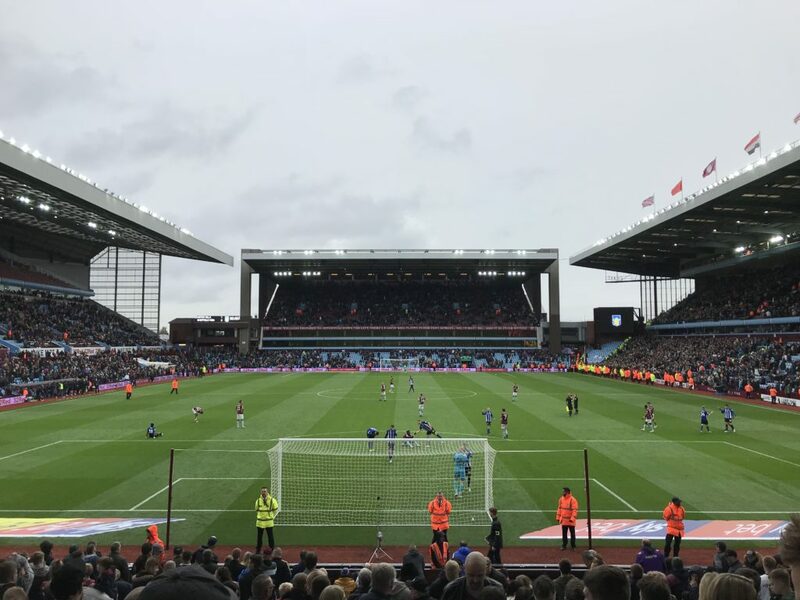 Whilst attention has obviously been drawn to his outrageous volleyed goal in front of The Holte End, McGinn’s grit, drive and tenacity are characteristics Aston Villa have lacked for a long, long time. McGinn makes the Henri Lansbury’s of this world look not just poor purchases, but woefully incomplete footballers to boot. However, Sheffield Wednesday quietly went about their business. The troublesome part of this was that they did so largely unopposed. Barry Bannan, a tidy if unspectacular player at B6, was granted the freedom of Villa Park. Rarely did Bannan look rushed as we watched him craft any number of positive moves forward for the hosts. And Wednesday would have rued glorious chances spurned had they not recovered from McGinn’s screamer. This though, is the baffling part. Whilst uplifted from the goal, Villa never used any of the momentum gained from the match swinging wildly in our favour. Indeed, we petered out and invited Fletcher the opportunity to finally put himself on the scoresheet, having missed arguably easier chances earlier in the game. Jedinak, once again irrationally deployed at centre-half, was embarrassed routinely for his lack of pace. Whilst the Australian Captain contributed more than one essential physical clearance, his mere presence invited pressure which Wednesday willingly exploited. It was painful viewing and is beginning to reek of abject stubbornness on the part of the manager in the face of repeated scrutiny of Jedi’s selection at centre half. As I’ve mentioned previously on these pages and the Podcast, using Jedinak in this way not only unsettles the backline, but particularly impacts upon James Chester. The Captain, a reliable mainstay in normal circumstances was all over the place positionally and constantly gifted the ball away cheaply. Adomah, bereft of form for months, struggled badly against Rotherham. Only Bruce knows why he opted to prolong the wingers suffering, despite having both El Ghazi and Bolasie as available alternatives. Their respective introductions were desperate actions that came too little, too late. Grealish also found himself constantly on the move between wings and was never deployed in his most effective position. It looked awkward and Grealish’s contribution suffered as a result. Arguably our most technical player, he was guilty of failing to react to the danger in the lead up to the Wednesday winner. The resulting cross was headed beyond the frail looking Nyland, with ease. Bruce looked to the heavens, as did our players, who then proceeded to hoof the ball mindlessly forward from that moment onwards. Chances were spurned too. Hourihane was unlucky to see a powerful drive deflect fortuitously wide, but should have done better from six yards, scooping wastefully over from close range. Kodjia, anonymous in large parts was subbed, but despite Villa’s need to chase the game, resulted in us sacrificing a striker. Just another decision that affected the teams balance, and one which serves to illustrate how the manager’s actions appear to impede rather than improve us at key times. Tammy Abraham; a potent, tricky player when permitted a supporting act, must truly despair. Especially when you’re watching balls being pumped up at you from cloud height. As a club we’re not entitled to anything. Most reasonable fans can accept that. Sheffield Wednesday deserved their victory. Villa were utter dross in the first half, and aside from McGinn’s solo efforts in the second, once again lacked any clear plan to win a game of football. Bruce may genuinely believe that he has the time to see his project come to fruition, but it seems unfathomable that even the most patient owner will sit by to see an entire season be left to chance. It’s not as though we are suggesting a sudden upturn in form and fortune. Whilst some regard losing the away fans as a barometer of a managers future (those fans called for Bruce’s head at Sheffield United don’t forget), I think that when you begin to lose the home support then you are on thin ice. Whilst the calls for Bruce’s head were by no means echoing from the rafters, they were audible at least twice. Those supporters have likely made up their mind, they’ll be hard work to win back, but Bruce should really worry about how many stand to join them. Your support has kept VillaUnderground.com alive since 2011. Please subscribe today & support independent Villa news. Oscar Borg SIGNS, Moyes Odds Shorten & Sellars LOAN. Report: Villa Park party gives Newcastle what they deserve. Sob On The Tyne Again. Blues (v) Villa Review: Second City derby reflection. Police, Aquascutum & the Panto Villain.